The 2013 Perseids will peak on the night of August 11th into the morning of August 12th but is very active on the night before or after as well. The moon will be illuminated at 25% which will only slightly interfere early in the evening, but the moon sets around 10:20pm. The peak of the shower is after midnight so there will be a perfectly dark sky for the main show. The radiant of the Perseids (where the meteors originate from) travels through the Northeast sky as you can see in the video below. This does not mean you should point your camera directly Northeast though. My recommendation is to face directly North if you’re shooting in portrait orientation (recommended) this way the radiant lands on the right edge of the frame. Why do you want this? 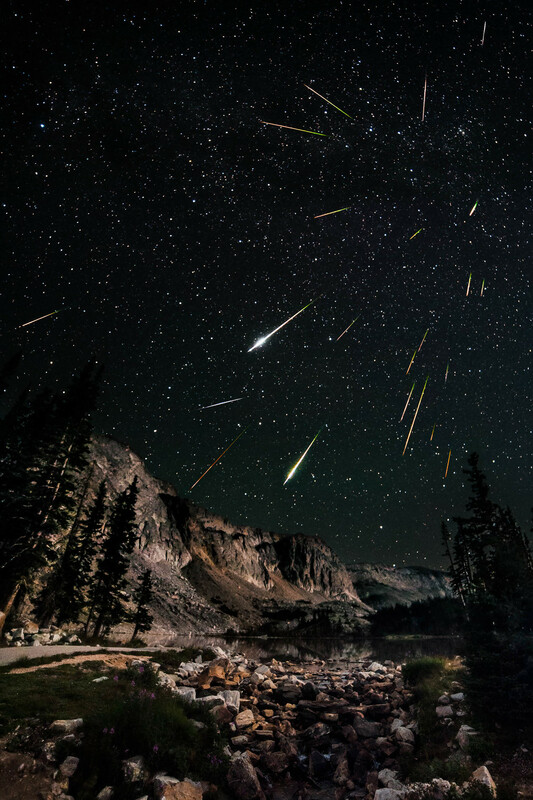 The meteors come from the radiant, but the meteors appear away from the radiant, so you need some breathing room to capture as many meteors as possible. You could face East to capture the meteors coming from the other side of the radiant, but the way the radiant moves through the sky doesn’t lend itself to travel through the frame well. Head over to Dark Sky Finder and find a location near you that falls in at least the green areas, but blue or black is preferred. There also should not be a large city to the North or NE of your location, not a total necessity but is preferred so the light pollution on the horizon doesn’t wash out the lower meteors. Fast Ultra wide angle lens (14mm on full frame) to capture as many meteors as possible, a fisheye would work well too. If you choose to shoot for the entire night (I will) you’re going to need a lot of battery power to take continuous shots for 8 hours. The best solution I’ve come up with is an external battery. If you don’t have the time to make one of these you will need to have a few batteries to spare, and change them throughout the night. A battery grip can be helpful in this situation because you can swap out the battery in the grip while the camera continues to work with the battery in the camera, plus you’re less likely to move the camera. How much battery you need varies widely depending on your camera. My D700 only goes 2 hours on a battery, but I’ve seen a D800 go for 6 hours on 2 batteries with power to spare. Best bet is to swap it out every 2-3 hours and warm up the partially used battery, you can swap this one in later in the morning when you’re running low. This method is best explained in the video above, but if you can’t view on YouTube for some reason, here is the written description. To start with I had to identify each image that had a meteor from the hundreds taken over the entire night. I did this in Lightroom using the color flags to identify each shot with a meteor. Once I had them all identified I selected all 23 shots, right clicked, Edit in > Layers in Photoshop. Once opened in Photoshop I changed the blend mode of the layers to lighten to easily identify where Polaris/North Star was located. This is the point we need to rotate around to correct the meteors to their radiant. I mark this point using the custom shape tool and placing a target symbol. Then I turn off all but the base layer and 1 additional layer. With the correct layer selected I activate the Free Transform tool, I then change the rotation point to the previously placed target. Now I rotate the layer until the stars align and finish the transform. Then I apply a reverse layer mask by Alt+Clicking on the new layer mask button. Then I zoom into the meteor, brush on the layer mask using white as my foreground color to show the portion of the layer with the meteor. Clean up any additional stars by switching your foreground color to black and painting them out on the layer mask. Repeat for each layer, delete the target when finished and flatten the image.